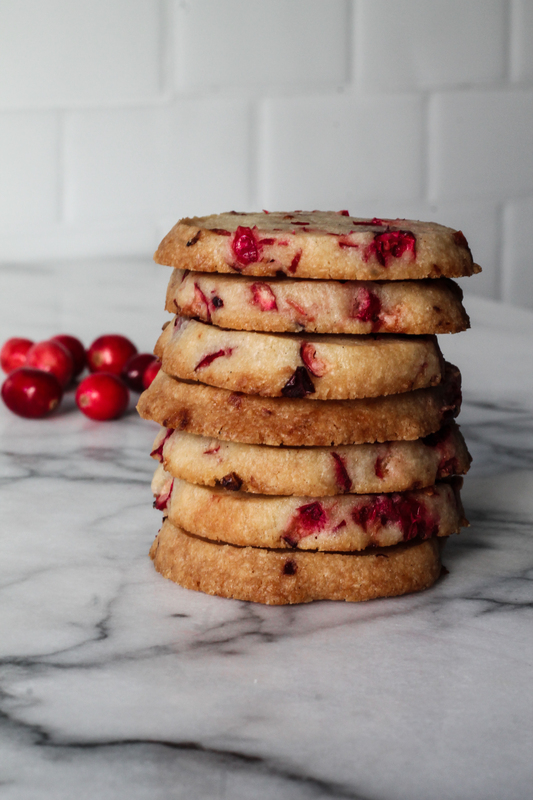 Cranberry Cardamom Shortbread Cookies, also known as the perfect winter cookie to snack on. Just because it’s the new year, it doesn’t mean we have to stop making cookies! Living close to Cape Cod, cranberries are a staple in our kitchen, not only when they are fresh and in season, but I always have a bag of frozen cranberries in the freezer during the summer for smoothies and baked goods. Cranberries are something I did not grow up with in the Dominican Republic and I’m so happy to have them in my life now that I live on Martha’s Vineyard! These Cranberry Cardamom Shortbread Cookies come together super easily in a food processor, but you can do it by hand if you don’t have a processor. 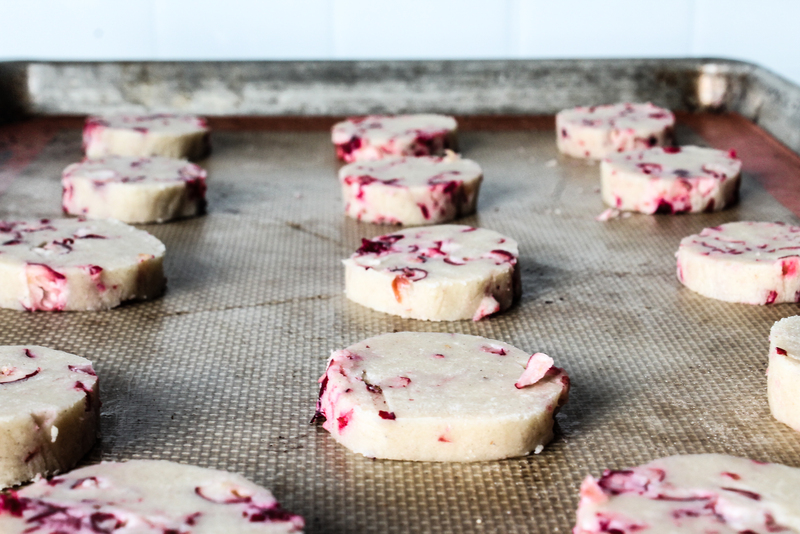 It’s a basic shortbread dough that I’ve added chopped fresh cranberries and cardamom, one of my favorite spices that really elevate these cookies. This recipe has become a favorite after testing them a few times: the way the shortbread dough crumbles and melts in your mouth, the tart cranberries that burst when you take a bite, and the aromatic cardamom really just make this such a complex cookie without much work. Make these cookies next time you’ve got a hankering for a sweet treat with your mid-day coffee or late night tea. If you make these shortbread cookies, make sure to tag me on Instagram at @marnely_murray so I can see them! These jewel-like shortbread cookies will be a treat any time this holiday season but they work well throughout the winter as well, with the use of fresh cranberries! Using a sharp knife, roughly chop the fresh cranberries. We will be making the rest of the recipe in a food processor, but the fresh cranberries need to be done by hand as to not over-chop them. Set aside. In a food processor, plus all the dry ingredients a few times to combine. Add in the butter cut in cubes - butter should be cold but pliable, not warm, not chill. Pulse the ingredients for 2-3 minutes until the dough comes together. As it pulses the butter will get warm with the friction of the blades, making the dough. The dough will be sticky. Scrape the dough from the processor and into a bowl with the chopped fresh cranberries, and fold them in. Spoon the dough on a long piece of waxed paper or plastic wrap. Carefully roll the dough inside the wrap, pressing gently to get it to form into a firm cylinder. Refrigerate for at least 4 hours, or place in the freezer for 20 to 30 minutes, or overnight. Before baking: preheat the oven to 350F. Remove roll of cookie dough from refrigeration. If in freezer, let stand on the counter for 15 minutes before slicing. Slice off as many cookies as you'd like and lay the slices on a baking sheet. Bake about 12 minutes until the edges of the cookies start turning a light golden brown.